Zdenek Holub claimed his first Panthers points against Glasgow. Promoter Ged Rathbone reckons it is vital that Panthers go into a three-week break from Premier League racing in possession of three more points. The city racers entertain Plymouth at the East of England Showground on Tuesday (7.30pm) in a meeting Rathbone predicts will be their toughest home test for the rest of the season. Panthers have reeled off five successive victories in all competitions and stormed into second place in the standings in the process. 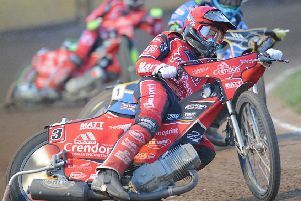 But the Devils won a league meeting at Alwalton last season after being beaten narrowly in two cup clashes, and they are again blessed with a stack of riders who are capable performers at this venue. Their number one Brady Kurtz, his older brother Todd, one-time Panthers rider Sam Simota, Kyle Newman, Jack Holder and reserve Stefan Nielsen have all ridden well here in the past. Rathbone said: “We knew we were going to be in for a very tough meeting against Glasgow last week, but the one against Plymouth is probably even more difficult. “Six of their seven riders have proven themselves as being very capable around the Showground. “Our meetings against Plymouth - home and away - are usually very close and I don’t see this one being any different. “But we have showed we are capable of beating any team at this level and need to continue to do that. “The fact we don’t then have another league meeting for three weeks makes it all the more important. Panthers don’t then race again in the league until they entertain Scunthorpe on Tuesday, July 12, but they do face Somerset in a KO Cup quarter-final over two legs before then. The Scunthorpe clash has been earmarked as a comeback date for injury victim Tom Perry. The British racer is currently undergoing laser treatment in a bid to speed up his recovery from collar-bone surgery. Panthers bosses are still working to arrange a new date for the home clash against Workington which was postponed on Tuesday due to a waterlogged track. The club have made the cut for the big Premier League Pairs event at Somerset on Friday, July 8. Edinburgh, Glasgow, Ipswich, Newcastle, Plymouth, Rye House, Sheffield, hosts Somerset and Workington will also feature in the event at The Oaktree Arena.